Amnesty International campaigners on Friday renamed the road outside the Saudi Arabian embassy in London as “Khashoggi Street” to mark the one-month anniversary of the dissident journalist’s murder in Turkey. 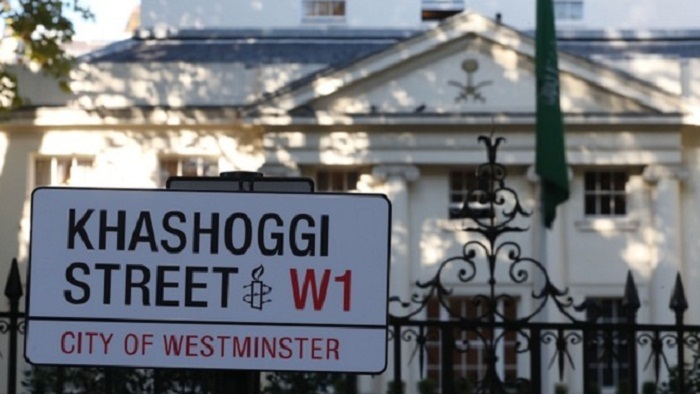 Activists from the London-based NGO temporarily erected a mock street sign in front of the diplomatic compound, in the British capital’s wealthy Mayfair district, in a symbolic gesture honouring Jamal Khashoggi. They staged the Friday lunchtime stunt to coincide with the time that he was last seen alive entering the kingdom’s consulate in Istanbul on October 2. “This is just a quick action to show solidarity with Jamal’s friends and family,” Kristyan Benedict, a campaign manager with Amnesty International UK, told AFP outside the embassy. He said Khashoggi’s close friends and family had urged activists to protest “in key states that are close to the Saudi regime and giving them diplomatic cover. Turkey has alleged a team sent from Saudi Arabia killed Khashoggi, whose Washington Post columns were frequently critical of powerful Crown Prince Mohammed bin Salman, inside its Istanbul consulate. His body was “dissolved” after he was strangled and dismembered, a Turkish official caimed Friday. The murder has shocked the world and dealt a serious blow to Saudi Arabia’s image. Turkey this week accused the kingdom of not cooperating fully with its investigation, amid increasing calls for a global probe into the case.